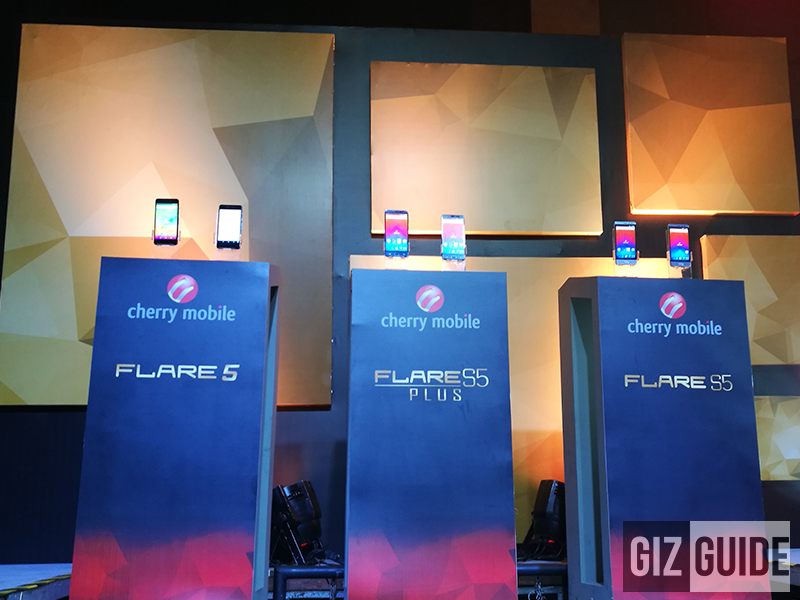 Cherry Mobile Flare 5, Flare S5, And Flare S5 Plus Announced, A Trio Of 700 MHz LTE Ready Phones! Home / cherry mobile / mobile / news / Cherry Mobile Flare 5, Flare S5, And Flare S5 Plus Announced, A Trio Of 700 MHz LTE Ready Phones! At Cherry's grand launch last night, the local tech giant has announced a trio of 700 MHz LTE ready Flare phones. They're the direct successor of the Flare 4 series last year, the Flare 5, Flare S5, and Flare S5 Plus. Report: Cherry Mobile Flare 5 And Flare S5 Is Now Available Nationwide, Price Starts At PHP 5499! The Cherry Mobile Flare 5 is a fully loaded budget phone that sports a 5 inch HD AMOLED screen, 64 bit octa core processor, 3 GB of RAM, 16 GB expandable storage, 2,500 mAh battery, 16 MP PDAF main camera, 8 MP selfie camera, and runs on Android 6.0 Marshmallow OS. The Cherry Mobile Flare S5 is the most affordable phone with USB Type C connection in the land today. It's equipped with identical specs with the Flare 5 except that it's using an IPS screen, has smaller 2,400 mAh battery, and loads with a fingerprint scanner for additional security. The Cherry Mobile Flare S5 Plus is a slightly upgraded version of the Flare S4 Plus. It boast a the same chipset found with its predecessor except that it now has a bigger 32 GB of internals storage, equipped with fingerprint scanner, and loads with USB Type C connection. The new Cherry Mobile Flare S5 series with 700 MHz LTE support will be available starting this November of 2016.